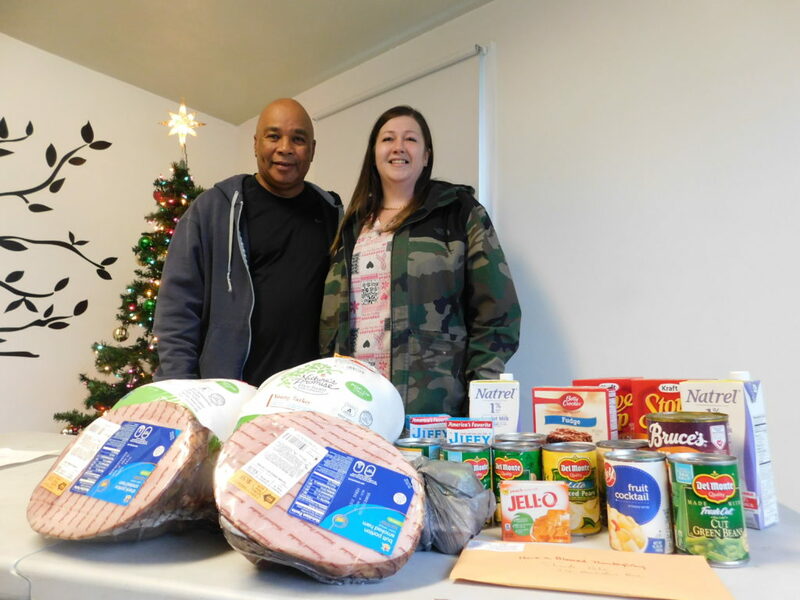 Thanksgiving came early for the Robinson Gardens Youth Group, and two luck families who were given the makings of complete holiday meals, two days in advance of the celebration. Thanks to generous donations from the Zion Community Baptist Church and longtime Youth Group friend Santino Tomassini, 15 teens took home turkeys and hams for their holiday meals, and two families got the complete works, from soup to nuts, as a gift to make things easier for those who often struggle to make ends meet. 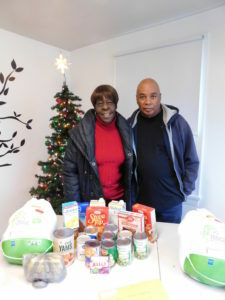 Robinson Gardens residents Joyce Brown and Shonda Pete were overwhelmed with gratitude for the dinners they received. Their meals, to be cooked at home, included the works, from turkey and potatoes to gravy, stuffing, yams, muffins, milk, and even dessert. Robinson Gardens resident Joyce Brown with SHA Youth Engagement Coordinator Jimmie Mitchell and the Thanksgiving meal she will cook and serve for her family. “I am so very grateful,” said Brown, who has lived in the public housing development in the Pine Point neighborhood for the past 45 years. It is where she raised her three children, and now lives with a granddaughter. Pete, the mother of four children, agreed. Pete took time to thank the generosity of the church as well as Tomassini, who often donates money, food or anything needed for the Youth Group. “This shows how much people care, and how generous they are. This is such a big help, it’s going to bring a lot of joy to my family,” she said. 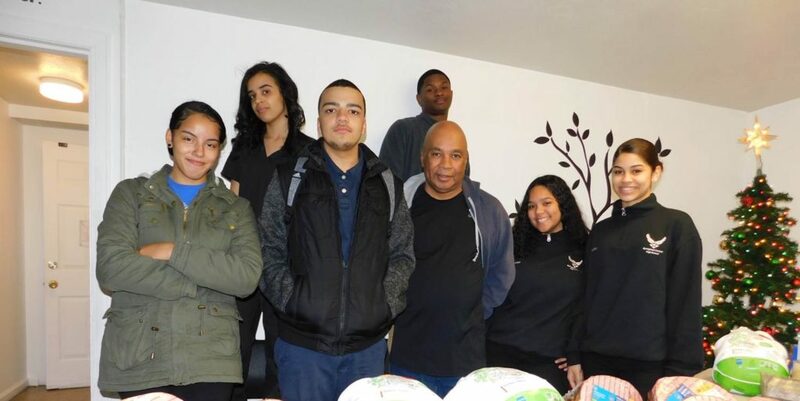 Teens in the Youth Group, run by SHA’s Youth Engagement Coordinator Jimmie Mitchell, also expressed gratitude for the hams and turkeys, along with sharing an infectious sense of excitement over the holiday and the long weekend. SHA Youth Engagement Coordinator Jimmie Mitchell with Jaleiry Reveron, who is president of the Youth Group at the housing development. 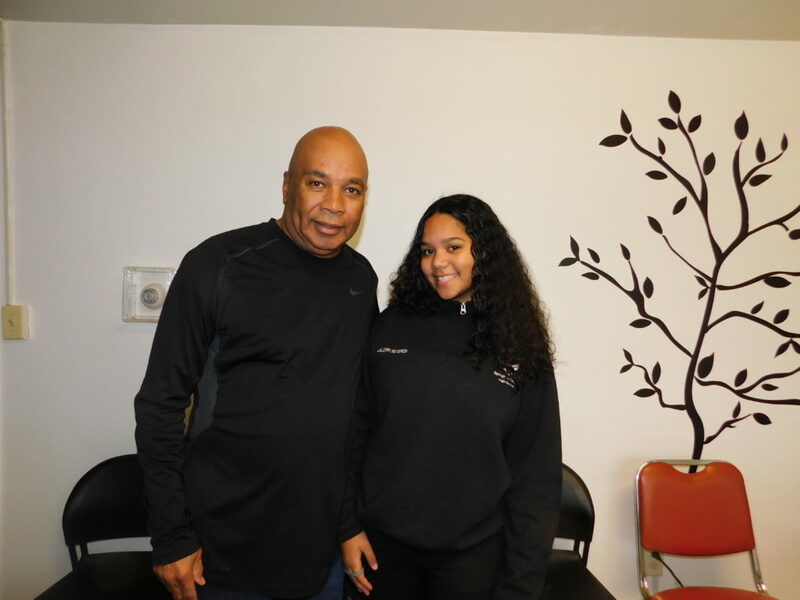 Jaleiry Reveron, who is 16 and a sophomore at Central High School, is president of the group that meets daily after school for speakers, events, and time on homework. 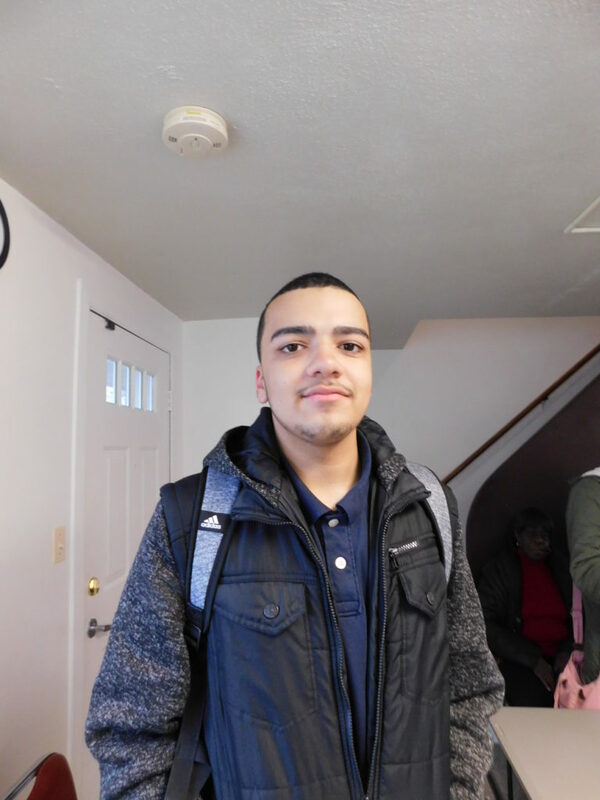 Reveron said the Youth Group is a positive way to spend after-school hours, making friends and learning things in activities aimed at academic achievement, higher education and jobs. “We’ve made such good friends here,” she said. “We’re like a family. 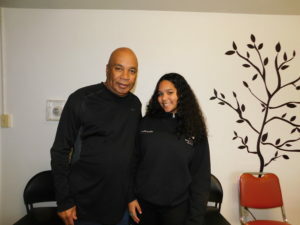 Mitchell noted that in his nearly eight years running the group, he has had great successes with teens. In fact, three-quarters of those who have been active in the group have gone on to college or higher learning, and the remaining one-quarter have gotten jobs and are productively working. SHA Youth Engagement Coordinator Jimmie Mitchell with Robinson Gardens resident Shonda Pete. “There are such good things happening here with these kids, we’re really making a difference,” said Mitchell, giving a nod to SHA’s new Executive Director Denise Jordan and thanking her for her support. Mitchell also thanked Tomassini, who has been a steadfast giver and supporter of the Youth Group for the past six years, after learning about it in The Springfield Republican, which has published stories and photographs of activities. “Santino is like one of us. We consider him a member of our group, that’s how supportive he’s been over the years,” Mitchell said. Youth Group member Christian Davis, who is 16 and a sophomore at the Roger L. Putnam Vocational Technical Academy, predicted that his family will be more than pleased with the ham he was bringing home. Robinson Gardens Youth Group member Christian Davis. He added that the Youth Group has also brought all good things into his life. “The group is a great thing for young people who don’t know much about the world,” Davis said. “We’re always learning and doing good things here. And we can get jobs. Mitchell has been active in helping Youth Group participants get summer jobs through the SHA and New England Farm Workers’ Council. Last summer, Davis worked in maintenance at Robinson Gardens, Duggan Park Apartments and Reed Village Apartments.